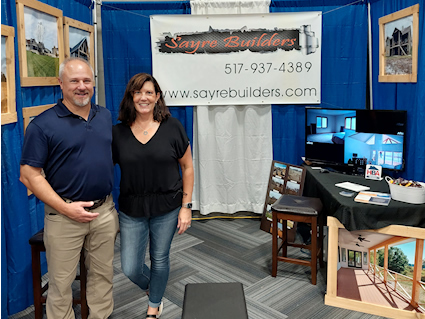 Thank you for visiting Sayre Builder's Inc. Your privacy is important to us. Keeping your data safe and increasing transparency are important to us. We have prepared this privacy statement to give you a better understanding of our information collection and use policies. This policy discloses how we collect, protect, use and share information gathered about you on our Web site. While visiting our site there are opportunities for you to contact us for additional information. The information voluntarily supplied by you may include: name, address, email address, mailing address, telephone number, fax number, various demographic facts and information about your interests as related to our business. Depending on what your inquiry is, we may also need to collect other personal information. We use the information you give us for contact purposes only and we do not sell information to third parties. Sayre Builder's may also collect non-personally identifiable information when you visit our site such as the type of browser you are using (e.g. Edge, Chrome, Firefox), the type of operating system you are using, (e.g., Windows or Mac) and the domain name of your Internet Service Provider (ISP). Collection of this information may not be readily apparent. For instance, when you come to our site your IP address is collected to enable our server to send online information you are requesting. This information is not personally identifiable. Sayre Builder's uses information collected through analytic technology to make our site more interesting and useful to you as described below. Sayre Builder's may use the information you provide about yourself to fulfill your requests for our brochures or additional information and to respond to your inquiries about our products. This information may be used to communicate with or respond to you as necessary, depending on the nature of your initial contact. We may use the non-personally identifiable information we collect to improve the design and content of our site. Sayre Builder's may also use this information to analyze site usage and to learn more about our customers so that we can continue to improve our products and services. We may disclose personally identifiable information in response to legal process, for example, in response to a court order or a subpoena. We also may disclose such information in response to a law enforcement agency’s request and we take appropriate measures to safeguard against unauthorized disclosures of information. Sayre Builder's will not use or transfer personally identifiable information provided to us. To provide quality workmanship and focus on putting our customers FIRST. Value and integrity is our commitment to our customers and we stand behind this with confidence. We are available days and evenings. Just give us a call, send an email or text us. If you want quality work done make sure to contact Mark Sayre of Sayre Builders! He did amazing work remodeling our bathroom and did not stop until the job was done perfectly. When Mark is working on your project you know it will be done the right way and completed quickly. Used Sayre Builders for a bathroom remodel. Very good work, fast, affordable and friendly. I highly recommend them.